This entry was posted in All Ideas and tagged PLUS short positions on November 23, 2015 . Playtech and Plus500 terminated their agreement today after FCA scrutiny. Cable Car’s questions remain unanswered. I’m visiting with family for the Thanksgiving holiday this week so will offer only a brief comment on Plus500. There are ample grounds for the observance this year after a truly remarkable 2015. The FCA raised confidential, unspecified objections to Playtech’s proposed acquisition of Plus500. I do not know whether it was Playtech’s shareholders’ personal histories, its gambling business, its acquisition of Epsilon Finance, its connections to unlicensed trading firms, Plus500′s unlicensed activities, its ongoing regulatory issues, its business conduct, or the characteristics of the business itself that led the FCA to block the transaction. In any case, who is allowed to operate Plus500 in Europe may shortly become irrelevant. As made clear by Playtech’s attempted expansion into financial products, highly leveraged CFD speculation is a tacitly acknowledged form of gambling. CFDs are not suitable as an investment product for the vast majority of retail investors. Under MiFID II regulations expected to take effect in 2017, European brokerages will be required to attest that complex financial products, including CFDs, are “appropriate” for clients. Guidelines remain in flux, but much of Plus500′s product offering as currently constructed appears designed for its activities in “unregulated” jurisdictions. How much revenue does Plus500 currently generate in regions where it operates without a license? UK clients seeking to open a Plus500 account today are directed to Plus500′s Cyprus subsidiary, and it is unclear if Plus500 will ever again be allowed to onboard new clients under its FCA approval. Despite the change in control objection, the FCA has not historically shown itself to be a terribly toothsome regulator. I do not expect dramatic fines and regulatory sanctions of Plus500′s conduct, although the outright withdrawal of the FCA license remains a plausible outcome. However, the scandal of passporting the Cyprus authorization remains. For the time being, I therefore assess Plus500 as a going concern. The company now proposes to repurchase shares and resume its dividend. Assuming completion of the full US$20 million buyback at today’s closing price of GBp 329, Plus500 would have approximately 110.9 million shares and GBp 45/share in cash. Added to this, the customer lifetime value approach described in Part 3 remains the only reasonable method of calculating the company’s franchise value. 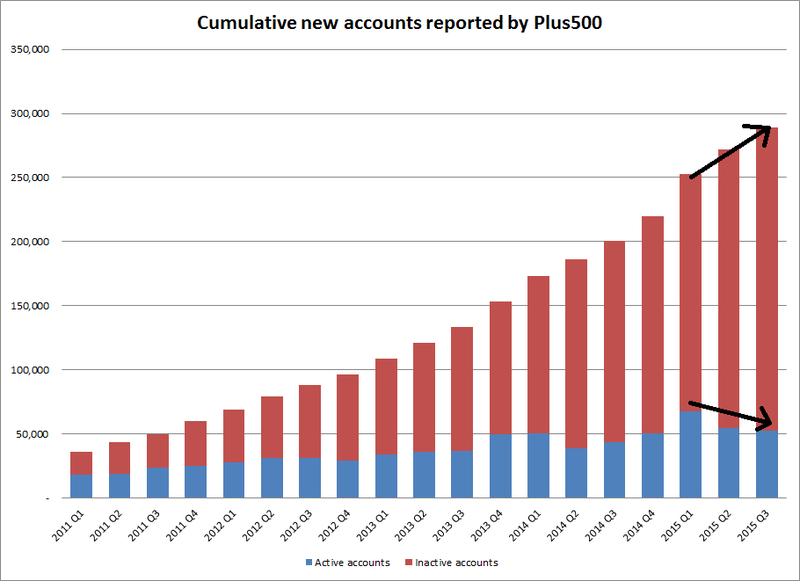 I recently updated the cumulative new accounts chart to reflect customer additions and churn from Plus500′s Q2 and Q3 trading updates. In both quarters, despite additional customer acquisition costs, the number of newly inactive accounts increased more than the number of newly active accounts. The total number of inactive customer accounts reached further record highs. At 30 September, I estimate Plus500 had 103,146 “potentially active” accounts using the methodology described in Part 3, which will generate potential net income of no more than $83 million before churning, or GBp 50/share after buybacks under the assumptions described in the original report. In other words, the market continues to place a significant premium on future customer acquisitions in 2017 and beyond, despite the major upcoming regulatory change in what is purportedly Plus500′s largest market. At current margins, the price is ~5x the value of the current customer base. How much unsegregated cash does Plus500 actually have? The company continues to have remarkably lax internal controls and financial reporting. Despite additional scrutiny of its financial statements, Plus500 has managed to reference three different cash balances (excluding customer funds) as of 30 June 2015. Does Plus500 properly segregate its customer funds? Which of the three mysteriously dwindling balances is correct? The interim report put cash and equivalents at $95.533 million, so the third amount isn’t even a rounding error. Notwithstanding PwC’s unqualified audit opinion, I question how the Board could possibly be comfortable with the 15 inconsistent disclosures identified in part 4, which have been forwarded to the FRC for review. Presumably, PwC did not also audit Geostrading, the mysterious Belize-based subsidiary the company has yet to acknowledge. Are the directors also comfortable with the historical operations of that entity? With respect to revenue generated from unlicensed jurisdictions, perhaps the Company could clarify how its purported European revenue in 2010-13 exceeded the gross revenue recorded at Plus500UK, the only licensed subsidiary at the time. Are any members of Plus500′s affiliate program related parties? Failing to address material historical omissions and misstatements could perhaps be forgiven in the context of a pending acquisition and delisting. Now that Plus500 intends to continue trading as a standalone public company, the Board of Directors and Nominated Adviser must meet their legal obligation to ensure that public disclosures accurately reflect the company’s true operations and financial position as soon as possible. I call on the company to respond directly to the outstanding questions raised in this series. Plus500 should immediately restate its disclosures and address its omissions regarding historical and ongoing unlicensed activity. This entry was posted in All Ideas and tagged FOIA short positions WRLD on October 9, 2015 . I don’t often write about World Acceptance Corporation, a position that was the subject of a detailed report last year but has since become relatively difficult to borrow. With potential CFPB enforcement action expected within the next few months, the stock is discounting uncertainty around the scope, severity, and consequences of the Bureau’s oversight. It remains a modest position, and I anticipate that an eventual wind-down/dissolution of the business remains probable, with varying potential equity recovery depending on the nature of the enforcement action. I have little to add on the exact nature of the CFPB’s theories of legal liability, although I have previously speculated that credit insurance, repeated refinancing, fee disclosures, and collection practices represent potential sources of concern. However, as an illustration of what is becoming an increasingly popular step in the investment process, I thought I would share a recent response from the CFPB regarding inquiries into that very question. Under the Freedom of Information Act (FOIA), government agencies are required to provide a wide variety of information generated by their operations, subject to several limitations. In particular, there is an exemption allowing agencies to withhold records compiled for law enforcement purposes. Investors and analysts have cleverly used this exemption as a way to confirm the existence of undisclosed SEC investigations. Cable Car submitted a FOIA request to the CFPB requesting copies of the NORA letter and response from WRLD. Under the law enforcement exemption, the agency must demonstrate that disclosing material would reasonably be expected to impair the enforcement process. Cable Car argued unsuccessfully that disclosing the CFPB’s theories of legal liability would not negatively impact an enforcement proceeding and sought redacted copies of the documents in the alternative. The latter request was unfortunately denied on the amusing basis that “release of any non-exempt information would produce only incomplete, fragmented, unintelligible sentences composed of isolated, meaningless words.” The semiotics of such a document might still be interesting, but I digress. Read the CFPB response to Cable Car’s FOIA request. Precedent enforcement proceedings have been initiated several months after a NORA response, so the rumor never made much sense to begin with. I believe a reasonably negative outcome for World Acceptance remains reasonably likely. This entry was posted in All Ideas and tagged PLUS short positions on May 30, 2015 . Customer complaints suggest Plus500 often treats users unfairly and in possible violation of law. I believe Plus500 will face material legal consequences for its treatment of customers, marketing activities, and disregard for local regulatory requirements. After publishing this series, I have been contacted by several former Plus500 customers who believe they were defrauded by the company. One individual in the Netherlands shared a long and extensively documented complaint, which was submitted to the FCA and the Financial Ombudsman in April. The current AML-related inquiry by the FCA is unlikely to be an isolated event. In light of the company’s actions toward its customers, I strongly suspect that the additional scrutiny stems from multiple such customer complaints. When a gambler visits a casino, the gambler gambles with the knowledge that the house has an edge. When a novice trader trades with Plus500, the trader knows the odds do not favor long-term success at highly leveraged CFD trading. However, the trader expects that the platform is organized in a way that is fair and objective, and that prices will accurately reflect developments in the underlying securities. A review of customer complaints suggest several ways in which this may not be the case. In this post, I’ll use a case study of complaints from a single Dutch affiliate forum to set out a few ways in which it appears the company has crossed the line. Thank you to MM for translation assistance. The forum in question is hosted by affiliates of Plus500 and offers Netherlands-based customers of Plus500 a Dutch-language venue to discuss their experience. Note that many customer complaints are by novice traders. They sometimes mix legitimate concerns with misunderstandings of typical financial contract terms. That does not change the basic facts of their complaints. Suitability considerations and regulatory requirements generally place the burden for properly documenting the terms and conditions of a trading platform on the company, not its users. I’m sure affiliates will explain away some behavior documented below as being part of industry norms, but the argument is not that Plus500 is necessarily the worst offender among all platforms. Being mostly fair, or fair to most users, is not sufficient. If Plus500 has in fact manipulated its platform to the disadvantage of some users, there will be significant consequences. At a minimum, Plus500 takes advantage of inexperienced traders. If the customer complaints are accurate, it also cheats them. Customers note that Plus500 sets arbitrary expiration dates for contracts that do not match the underlying instruments and are not always clearly communicated or adhered to. Expiry terms are not well-documented, and Plus500 sometimes expires existing contracts early, without prior notice. Contract expiry typically occurs on a weekend at the last Plus500 quoted price on Friday (not necessarily the relevant underlying price)—this is how Plus500 records profits on Saturdays. Plus500 retains sole discretion to roll contracts to the next expiry. Customers opening positions in a new contract do not have transparency into which futures series is used to determine opening prices. Trader Rokil complains about an unannounced early expiration in Coffee, resulting in a loss. Trader Fredkroket says this happened to him in Bitcoin as well. Trader Snarf complains about an expiry date unexpectedly set one week before the expiry date of the underlying front-month contract at CME. Administrator Armijn admits he also missed an expiry date once and lost money because it was written in fine print on the second page of an instrument. Trader Navras replies with the same experience. Plus500 retroactively changed the expiry date of an outstanding Bitcoin contract, resulting in a loss for Trader Peacock. Trader Linda mentions a similar experience with Facebook. She claims her trade history on that instrument was erased. Trader Freedom Capital on an English-language website describes how a Bitcoin contract with a November 30, 2013 expiration date was closed in mid-November and replaced with a daily expiration (with higher costs) without notice. A basic principle of dealer-model CFD brokerage is that customers cannot owe the brokerage more money than they have on deposit. However, because Plus500 takes a long time to process withdrawals, it sometimes uses the delay to its advantage. Customers have reported withdrawn amounts, which were already debited from their Plus500 accounts but had not yet been transferred, being cancelled and returned without warning, placing the funds at risk to cover open positions. Other customers have reported suspicious timing of rejected withdrawal requests, despite proper documentation, that occurred within minutes of new positions being opened. Trader Thomasson reports funds he had already withdrawn were returned to his account to cover a margin deficit. The withdrawal was still ‘pending’ but had already been debited from the account for several days when he went below margin. Plus500 used the withdrawn funds to cover the margin deficit, but this amount was insufficient so the positions were closed at a total loss of both the withdrawn amounts and other monies on deposit. Several users have reported unexplained, system errors that prevent positions from being closed while in a profit position. In other instances, profitable positions remain open and exposed to market risk because Plus500 chooses not to make quotes available on the platform at its discretion. Trader GBG could not close a USDRUB position at a profit one hour before the stated closing time of the market. He tried unsuccessfully for an hour, the market closed, and the next day his position changed to a loss and could once again be traded. Plus500 support responded that the ruble was unavailable for trade due to ‘low trading volume’ despite external trades taking place in the underlying. GBG has complained to the FCA and changed brokers. Trader Verlangen complained that he could not close his position at a profit; the close button did not work. After his trade entered a loss position, he could close it again. Traders cite a variety of arbitrary rules and actions by the company that work to their detriment, including closed accounts, price divergence from the underlying, and different withdrawal limits for different users. Some traders claim prices quoted on Plus500 demonstrate higher volatility than the evolution of the underlying, resulting in additional losses for leveraged traders. As discussed in Part 8, traders worry about the definition of “scalping” in the User Agreement. While Plus500 appears to ultimately resolve scalping complaints in favor of the users who push back (after several months, in the case of two different Singaporean users), how many more inexperienced traders simply go along with it when they are told that their profits are illegitimate? Discussion about scalping; traders worrying if trades under ten minutes are considered scalping.Trader Ikbener somehow managed to open two accounts and made EUR 4,500 from his sign-on bonus. The profitable account was closed, and he was not allowed to collect the profit. Trader Johanserv complains about inexplicable differences between quotes at Plus500 and on other financial sites. Trader Pokemon asks about the minimum amount of money he can withdraw. Administrator Armijn and Linda figure out that it is different for all users. For the administrator himself, the minimum has increased over time; he speculates that it might reflect higher bank costs. Trader Linda concludes that it is completely unclear how and why Plus500 determines the minimum withdrawal sum for various users. Trader Vijo complains that Plus500 closed his account after two years of trading, without announcement or reason, and made a new one for him while not transferring all of the money or positions on his old account. Plus500 support stated that his new account was reopened at Plus500′s Cyprus subsidiary, Plus500CY. The miscalculation of money in the old account was never fully explained. We reviewed your account and would like to inform you That as you already agreed by accepting the New User Agreement, due to a regulation change – from The Financial Conduct Authority (FCA) to the Cyprus Securities and Exchange Commission, your old account was closed on 02.16.2015 and the balance of (€ -157.67) was Transferred to a new account with the same email address, but under the new regulation. You can still have access to your previous account under the email: old_mail@emailadres.nl and your old password, for information and taxation Purposes, for 30 days after the opening of your new account. After That period the old account (old_mail@emailadres.nl) will be closed and you will be trading into account: mail@emailadres.nl. This change did not have any effect on your account’s trading only the change in e-mail. Your current account is exactly the same as the old one, simply under a different regulation. In addition to the above individual experiences, the customer complaint to the FCA documented an extensive list of ways in which the Plus500 User Agreement is inconsistent with Dutch Law and the UK’s Unfair Contract Terms Act. It also highlighted numerous ways in which the trading platform is risk-enhancing and unsuitable for novice traders. Minimum order sizes and thresholds are in some cases larger than the tick size of the underlying instrument. Default order sizes are very high relative to customer account balances. Plus500 also upgrades most users to a “Gold account” after a short period of activity, setting the default order size and leverage limit to a much higher level. I am not an attorney, but I have four theories of how legal liability could attach to Plus500 as a result of these and other actions, some of which were referenced in Part 9. While customers have been contacting journalists, short sellers, and the FCA, they really should be in touch with a competent multi-national law firm. The allegations just among Dutch customers alone appear sufficient to support a class action suit. This is a situation where a determined prosecutor or advocate could make a real difference for customers who have lost money unfairly. Class action complaint by customers: I recognize that the United States is a much more litigious society than Europe. Here, there would already have been multiple shareholder derivative actions based on all the things people were upset about at the AGM. However, the allegations documented above are serious and warrant investigation. If a court determined that Plus500 acted abusively, restitution and punitive damages could be significant. Foreign regulatory fines and claims: Plus500 operates without a license in many parts of the world, as detailed in Part 11. Any customer losses attributable to the platform are in theory null and void, as the company operated without authorization and could not enforce its user agreement. While it might be difficult or impossible for a foreign regulator or court to enforce a judgement upon Plus500, the risk remains. Plus500 operates using currencies and the international banking system in ways that may bring it into the regulatory net of other countries, including the US. Local marketing violations: Plus500 notes in the Admission Document that its affiliates may run afoul of local securities marketing requirements. It does not note explicitly that it accepts affiliate marketers located in jurisdictions where it is not authorized to operate, including the United States. Affiliates who receive revenue sharing arrangements are in effect participating in a multi-level marketing scheme and receiving up to 30% of the turnover of an unlicensed broker-dealer. The US SEC and Department of Justice are not likely to look kindly upon US persons profiting from the operations of a foreign securities firm that is not authorized to operate in the US, while using US means of commerce to promote that entity. Local authorities have been notified. UK or Cyprus regulatory fines or loss of registration: So far, the FCA has not shown itself to be particularly punitive. At the AGM, Plus500 said there was no evidence that the FCA will issue a fine for Plus500′s AML procedures. However, if the allegations by customers are true, there may be meaningful consequences for other behavior. With that, I will reiterate the question I raised in Part 10: Would you do business with Plus500? This entry was posted in All Ideas and tagged PLUS short positions on May 27, 2015 . Cable Car remains short Plus500 with a revised price target of 52 pence (GBP 0.52). Plus500 faces material legal liabilities and has yet to address its undisclosed Belize activities, filings inconsistencies, and misrepresentations regarding customer losses. Below, I will address the wholly inadequate response from Plus500, which was published in an RNS last Wednesday. Before I do, however, I have one small mea culpa. In publishing such a large volume of material, I inadvertently neglected to translate Plus500′s stated cash balance of $88 million from USD to GBP. As a result, I published a price target that was too high. Using the updated cash balance of $92.2 million and an exchange rate of 1.53 GBPUSD, Plus500 has approximately GBP 0.52/share of cash on hand today. The per-share lifetime value calculations in Part 3 are similarly expressed in USD and are thus too high by the same factor. Consequently, I now value the cash plus potential earnings from the current customer base at GBP 0.84-0.98. This estimate is based on the potential profitability of the customer base as of Q1 2015 using 2014 ARPU and margins. It does not include remediation costs, reduction in trading activity, or loss of users due to the ongoing account freeze, all of which are likely to be significant. I regret the error. If any other aspect of this series is factually misrepresentative, I will gladly correct the record. I continue to believe that if the questions raised in this series are not adequately addressed, the company will ultimately cease to continue as a going concern and hence reiterate the stated cash balance as my price target. In addition, I believe Plus500 will face material legal consequences from its marketing activities, geographic presence, and treatment of customers. More details are in Part 12. The Board is aware of recent press and blog commentary regarding Plus500′s accounting policies and business model and rejects the assertions made as misrepresentative and baseless. The Board reiterates that the Company’s accounts, along with those of its subsidiary, Plus500UK Limited, have received unqualified audit opinions from PwC and the directors are comfortable with the disclosures made therein. In response to the specific issue raised in respect of the restatement of Plus500UK’s subsidiary accounts and the implication that Group revenue is substantially over-stated or a substantial amount is generated in unlicensed jurisdictions, we clarify that both assertions are incorrect. The application of the new Financial Reporting Standard 102 resulted in the reallocation of gross revenues attributable to Plus500UK’s customers to Plus500 in the Company’s 2014 results. This also required the 2013 results to be restated. The reallocation has no impact on Group consolidated revenue. While I was hardly expecting a detailed, 10-part follow-up to the questions raised by this series, this response is rather anemic. Plus500 has addressed one concern raised in the report. Now what about all the others? The basis for each statement made in this series has been painstakingly documented; I stand behind every assertion and challenge the Board to identify any claim that is baseless. I further pledge to correct any misrepresentation, as noted above. Revenues at the Group level were overstated. The inter-company agreement was modified or terminated. The FAS 102 transition (FAS 102 is a modified form of IFRS that replaced a previous UK GAAP standard) required revenues to be reported net of payments to the parent, instead of gross. The company says that the third explanation, which I suggested was the most charitable possibility, is the case. Very well then. Net revenue presentation in the subsidiary will unfortunately reduce transparency and make it more difficult to reconcile Group revenues going forward, but if that’s what accounting rules require then so be it. The subsidiary accounts remain somewhat puzzling. PwC’s own summary of the differences among old UK GAAP, FRS 102, and IFRS does not suggest any inventory or financial asset fair value reporting changes that appear to require restating a cost of sales item as an offset to turnover. It is also unclear why the adoption of FRS 102, which did not modify revenue recognition, would result in a switch from gross revenue to net revenue reporting in the first place. The variable treatment of “introductory commissions” is also odd considering the only categories of funds payable to the Parent under the inter-company agreement are 78% of dealing spread revenue above $300,000, 5% of credit card transactions, and the profit/loss on offsetting hedge transactions. Credit card transactions are reported as a separate cost item. Why is the bulk of introductory commission recorded as a reduction in revenue while a portion is recorded as a distribution cost? In any case, investors will ultimately have to trust that the accountants know what they’re doing here. I’ve highlighted why their work deserves scrutiny. Brevity is clearly not my strong suit: the latter half of this series received noticeably less traffic than the first few posts. If you’re still with me, there are several very important points raised in the latter half of the series that I would like to emphasize and update. In Part 6, I documented the magnitude of revenue reported from customers outside of regulated jurisdictions (line C). The amounts were particularly egregious in 2010-11 when Plus500UK was the only regulated subsidiary, but even in 2013 the extra-legal amount significantly exceeds revenue reported at Plus500AU (approximately $3.2 million). To be clear: $67 million (27%) of the company’s reported revenue from 2010-2013 came from customers in locations where Plus500 did not have legal authorization to operate. This is significantly more than disclosed in the Admission Document and annual filings. In 2013, estimated revenues from customers in Europe were also disclosed. They have been added to lines D and E in the table below. Similar geographic disclosures were not made in 2014, so it is no longer possible to track the contribution from unregulated jurisdictions and Europe overall. However, the inconsistency in Plus500′s disclosures remains. For the period from 2010-13, Plus500 claimed European customers generated $40 million more gross revenue than was actually reported by Plus500UK. I cannot think of a charitable explanation for this. One or more of the following must be true: Group revenue was overstated, customers in Europe were served by an unregistered subsidiary, or the geographic disclosure deliberately overstated the proportion of revenue generated in regulated jurisdictions. In Part 7, I focused on 10pips.com, an unlicensed Plus500 clone that operated until mid-2010. It turns out it was not the only one. MeVideoCY also operated a very similar site called Omitrade.com from 2009 until at least March 2011. Not only is this site unregistered and undisclosed by the company, but there are several violations of securities advertising rules on the site, such as referring to sign-up bonuses as “free”. How many other unlicensed sites did Plus500 operate? Is Plus500 operating unlicensed websites today? A correspondent reminded me that in Part 7, I omitted Norway from the long list of regulatory authorities that have warned against Plus500. In Part 8, I commented that I have no way to asses the merits of individual claims of unfair treatment on the Plus500 platform. In Part 12, I try to remedy this by investigating some specific allegations of abusive practices and considering the potential consequences in more detail. Plus500 claims to be a client of Interactive Brokers. I haven’t been able to verify that. If you’ve read this far, I hope I have at least conveyed why I take statements from the management of Plus500 with a grain of salt. Given the company’s history of unlicensed operations, inconsistencies in its filings, and its exaggerated marketing claims, I want to leave you with one simple question—would you do business with Plus500? Neither would I. And I was surprised by the notion that my own custodian would. In Dan McCrum’s piece after the Swiss Franc peg was was removed in January, Gal Haber told the Financial Times that Plus500 uses Interactive Brokers when it needs to hedge. This immediately struck me as odd—Interactive Brokers has a competing CFD offering. Unlike Plus500, Interactive Brokers charges a fixed commission rather than a spread-based fee, and my understanding is that although the firm acts as principal, it makes offsetting trades in the underlying instruments. In other words, Interactive Brokers is not a bucket shop. Why would Interactive Brokers facilitate the growth of a competitor? Why wouldn’t Plus500 have hedging relationships with the major banks (e.g. Barclays) that hold its customer balances? Moreover, the size of the notional exposures Plus500 claims to need to offset, even occasionally, would make Plus500 a very significant client for Interactive Brokers. Given the business risk associated with working with a company that has admittedly operated outside the law in some jurisdictions—including places like Singapore and Hong Kong where Interactive Brokers’ business is growing rapidly—it seems like a questionable business decision for them to maintain a client relationship with Plus500. Since Cable Car’s clients custody with Interactive Brokers, I care a great deal about their reputation. Naturally, I relayed some of my concerns about Plus500 to the company. The response was interesting. Interactive Brokers is a large firm, and its US representatives may not have complete visibility into every client worldwide, especially if the client may have been referred by an introducing broker. That being said, they could not confirm that Plus500 is a client. Whether or not Plus500 works with Interactive Brokers, they clearly don’t trade enough to merit much attention. This stands to reason. The simplest explanation for why Plus500 was profitable during the Swiss franc debacle is that they simply didn’t hedge at all. Amusingly, the Plus500 hedging policy document is an empty redirect to the homepage. Customers were net long EURCHF; Plus500 was net short. Any negative customer equity balances did not reflect money Plus500 owed to any third party. Instead, Plus500 would have booked the customer’s entire account balance as trading revenue. This concludes my series on Plus500. I look forward to feedback from readers and clarifications from the company. If there are any errors or omissions in these posts, please do not hesitate to let me know so that I may correct them. Thank you for reading. Gotham City Research is on my mind as I write this. I have no affiliation with Gotham and have never met Daniel Yu, but he’s been in the news lately for comments about Plus500. In addition, Gotham keeps me mindful of the fact that the Internet is global. Even though British libel judgments are unenforceable in the United States, I have no wish to be sued for expressing my opinions in good faith. I have written these blog posts in a deliberately restrained manner and intentionally not directed my comments at UK persons. In the past, the Group has been in breach of, or may have been in breach of, and there is a risk that going forward the Group may not be in full compliance with or may be in breach of, the laws and regulatory requirements regarding the promotion of investment activities in some of the jurisdictions in which it advertises. Any non-compliance with such applicable laws or regulatory requirements could subject members of the Group or its directors and/or employees to disciplinary action, criminal penalties, civil lawsuits and/or fines. Further, there is a heightened risk of the FCA imposing a sanction on Plus500UK as a result of repeated instances of non-compliance with the financial promotions regime. Any such action could have a material adverse effect on the Group’s reputation, business, financial condition and operating results. Further, the Group has not investigated the local laws and regulations which may apply to its affiliates’ activities or the relationship between the Group and its affiliates, and the Group has no visibility or control over whether the affiliates are conducting their advertising activities in accordance with such laws and regulations. There is a risk that liability for activities of affiliates which are in breach of local laws and regulations could attach to the Group and result in civil, criminal, regulatory or other penalties being imposed upon the Group or its directors, or that such activities could result in or contribute to action being taken against the Group by a regulator in any relevant jurisdiction. 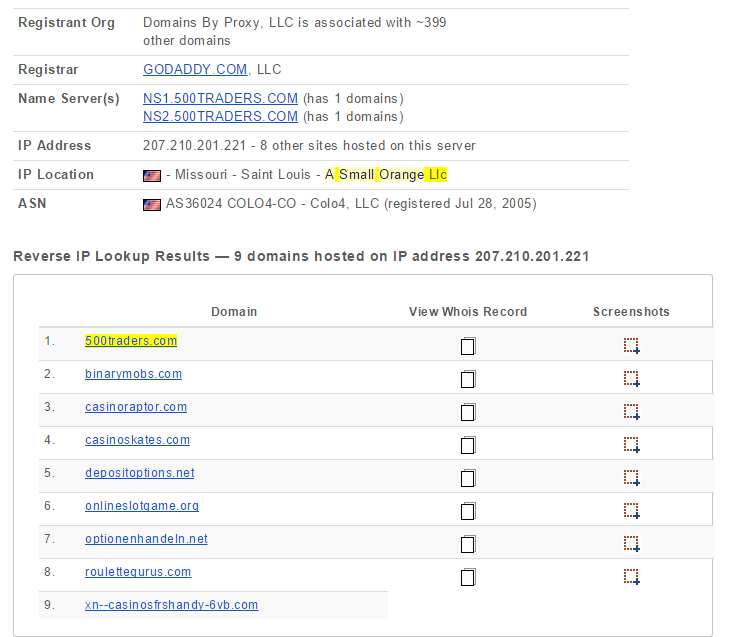 The hosting provider in question, A Small Orange, operates a web server in St. Louis that hosts several gambling-related domains, likely for the same affiliate marketing customer. Not only are several of these domains advertising services illegal under US law, they also appear to violate ASO’s terms of service. ASO did not respond to a request for comment. In an interesting coincidence, ASO’s parent company is Endurance International Group (EIGI, no position), the most recent target of Gotham City Research. A full reconciliation of Plus500′s marketing activities to local investment promotion regimes is beyond my limited resources, but suffice it to say that 500traders.com is hardly the only Plus500 marketing website that could attract customers from jurisdictions where the company is unlicensed. The Whois record for 10pips.com suggests a possible undisclosed related party. “yossi sh” does not appear to be a real person, but crazymarketing.com is one of 65 domains registered to a Vadim Drabkin, who attended the same university, Technion, as the Plus500 founders. We already know that 10pips.com was operated by Plus500; it is unclear why it is now registered to one of Plus500′s affiliate marketers. Note the @investhead.com email address. Investhead.com is currently a defunct website, but it redirected to 10pips.com in 2011 and later displayed affilliate advertising for Plus500, among others, until late 2012. This indicates that Vadim Drabkin has been acting (and possibly being compensated) as a member of the Plus500 affiliate program while also controlling one of Plus500′s assets. In short, one of Plus500′s affiliates owns a domain name that was operated by the company. Successful traders at Plus500 often complain of difficulties withdrawing funds. Plus500 has in some cases tried to void profitable transactions, even in jurisdictions where it is operating outside the law. There are numerous examples of users discussing their experiences with Plus500 online. One trader complained that his account was frozen for ‘scalping’ after he generated profitable trading activity in February 2015. Scalping is referenced in section 24.1.3 of the user agreement, but it is not clearly defined. Even though most Plus500 trades have a duration measured in minutes, according to the company’s own data, the user agreement contains the clause “a significant number of transactions with short duration may be deemed as Market Abuse” giving the company wide latitude to reject any profitable trading activity. I have no way to assess the merits of individual claims, but making it more difficult to withdraw funds when customers are profitable would be broadly consistent with a business model designed to ultimately separate customers from their deposits. As a concrete example of Plus500 operating outside of legal bounds, consider one such complaint by a customer in Singapore. I contacted the individual in question and learned only that he eventually received “his money back” after a delay of several months. I will update this post if I learn more about his experience. However, what is more remarkable is that Plus500 was operating in Singapore in the first place. The domain www.plus500.sg redirects to Plus500.com. Yet Singapore has very clear prohibitions against bucket shops.under the Commodity Trading Act (see note 14). It should be uncontroversial that operating a bucket shop in Singapore is illegal. Separately, it may be worth examining the transaction record posted by the customer. I’ve uploaded a version so there’s no need to register on the Forex Peace Army website. To my eyes, the BTC trades look like very fortunate trading during a period of extremely high volatility in the underlying instrument. Perhaps Plus500′s software was slow to catch up to market developments. The nice thing about Bitcoin is that there is a blockchain transaction record that covers every transaction on every major BTC exchange. It should be possible to compare the customer’s transactions to the historical record and draw your own conclusions, if desired. Plus500 appears to have an undisclosed Belize subsidiary called Geostrading Ltd. Plus500 previously ran an unlicensed operation under the brand 10pips.com. Plus500 admits to unlicensed activity in its Admission Document. It is interesting to review what that actually entailed. Two very useful websites, the historical whois records lookup on Domaintools.com and the Wayback Machine, reveal elements of Plus500′s past that it has not chosen to share with investors. In the Admission Document, Plus500 discloses only the existence of a dormant Cyprus subsidiary called MeVideoCY, without any discussion of what this subsidiary was or what it did. Unmentioned entirely is another entity that may or may not actually exist: Geostrading Ltd, a Belize-based entity also referred to as Plus500 Ltd, Belize. I have been unable to locate any records of this entity other than its repeated mention on Plus500 and 10pips.com marketing materials still scattered around the Internet. Google “Geostrading Ltd” and every result is related to Plus500 in some way. There is an excerpt from an old English-Malay translation request. There is a Spanish-language affiliate’s website dated 27 December 2012 that still refers to Plus500 as being operated by Geostrading Ltd. There is even an amusing discussion thread in which a Plus500 representative tries to convince skeptical moderators of a website validation service, Web of Trust, that its business is legitimate. And of course there is 10pips.com, which I will discuss in a moment. Beginning in July 2010, after Plus500UK received its FSA license, the phrase disappears entirely. Whois records also reflect these changes. Note the UK (+44) country code for the phone and fax numbers for the Belize entities. There also seems to be a private joke of some sort listing the administrative contact as “Hedge” Haber, perhaps a play on Gal Haber’s name. Prodromou Court, 54 Sittika Hanoum Str. Wayback Machine archives of 10pips.com reveal a strange evolution from an online backgammon affiliate site to a fully-fledged trading platform operated by MeVideoCY very similar to Plus500. 2007: 10pips.com is a placeholder. 12 June 2010: The last capture before 10pips.com was closed on 14 July 2010. 8 August 2010: By August, 10pips.com was replaced with a redirect to Plus500. 10pips.com also includes a link to the “Costumer agreement” from March 2009 that makes explicit its operation by MeVideoCY. (They caught the typo by July). The user agreement page remained active until November 2013, although Plus500 states in the Admission Document from July 2013 that MeVideoCY was already dormant. Apparently, 10pips.com ran an active affiliate marketing scheme and international unlicensed CFD business right up until Plus500UK received its FSA authorization. The website was pulled without warning less than 3 weeks before the license was granted, angering some affiliates. More on affiliate marketing and 10pips.com in Part 9. In addition to the warnings from regulators in Hong Kong, Quebec, and Brazil already cataloged by Dan McCrum, the activities of Plus500 generated additional warnings from Slovenia and Greece. Cyprus warned both Plus500 and MeVideoCY in 2009, although apparently all is forgotten now that Plus500 has received a license from Cyprus. Most recently, the Croatian regulator issued a warning to Plus500UK in 2012 before being forced to backtrack in 2013 due to the passporting mechanism of Plus500′s UK license in the rest of Europe. The Croatian regulator nevertheless stands by its warning to customers. Perhaps investors should heed it as well. Plus500′s purported 2010-11 revenue was either generated illegally or not at all. Inconsistency #8 in Part 4 is significant enough that it deserves its own post. Revenues are translated at period average exchange rates. EEA/Gibraltar revenue for 2010-2012 is based on percentage of Group revenue disclosed in the Admission Document. There are two important takeaways from the $24.2 and $50.0 million in reported 2010 and 2011 revenues in the Admission Document. The first is that these amounts exceed the revenue reported in the Plus500UK subsidiary by over $20 million both years (line C). We already know that the Plus500UK revenue was reported on a gross basis prior to the 2014 report, so any difference must arise from the Parent or another subsidiary. We know from the Admission Document that Israel represented a very small proportion of revenue (2%). The Australia and Cyprus regulated subsidiaries were not yet up and running. Therefore, the remaining revenue must have been generated in other jurisdictions, where Plus500 was unlicensed. The Group has grown rapidly and as part of this growth has, in the past, commenced trading in a limited number of jurisdictions where operations have been found to constitute, or are likely to constitute, an offence and the penalties (whether civil, criminal, regulatory or other) against the Group or its directors are unknown. It seems probable that Plus500′s dormant subsidiary MeVideoCY Ltd. (p.84) was responsible for these activities. More on this in Part 7. However, it is not possible to reconcile this $43.7 million of unlicensed, unregulated activity with the customer domicile disclosures in the Admission Document. The second important takeaway is in line E of the table. In 2010 and 2011, respectively, the Admission Document claims that 77.1% and 85.7% of turnover was generated within the EEA and Gibraltar—under the aegis of the FSA. If the Admission Document is accurate, Plus500 generated $17.1, $13.9, and $5.1 million in 2010, 2011, and 2012 from UK/European customers without those revenues flowing through Plus500UK. Did Plus500 conduct unlicensed activity in the EEA even after its license was obtained in 2010? Alternatively, did the Admission Document misrepresent the geographic origin of Plus500′s customers? Did it present 2010-11 revenues that were higher than the company actually earned?